I've been hanging on to these NOS brakes (arms and pads) for a while now, waiting for the right frame to put them on. This is how I have them set up, not by any method, just by aesthetics; meaning I didn't use any particular formula to figure out the yoke height or cantilever angle. So far, they don't stop as well as I'd expect. I'm wondering if anyone out there has experience with setting these puppies up. Would increasing the cantilever angle (thus decreasing the straddle cable angle) increase mechanical advantage? Should I ditch the current pads for ones with longer posts so that I can achieve that goal? Ditching the current pads for ones with better compound would be a good start. From a neutral setup pov, you've got it pretty much correct. You might try a slightly shorter straddle cable. Can't see the pic, but if they are the original pads, throw them in the garbage, then set the garbage can on fire, then burn down the house surrounding the burnt garbage can. And whatever pads you replace the originals with, make sure to never bring them near the site of the burnt house/garbage/brake pads. do you say that because old pads tend to get hard and just not work well, or because you have experience with the pads that came with the brakes? the brakes were stored well, and the pads were soft. I do find them to be a little small, and the posts are short. I am going to replace them with some kool stops. I've been riding with these brakes on my MTB/commuter bike for 10+ years and get great performance, with good feel and modulation from them. But I remember form the early days how important it was to get the shoes properly mounted. New good quality shoes, such as Kool Stop properly mounted for optimum strike angle when they hit the rim will be a big help. The best way to set the shoes is to hold them square to the rim with a dime trapped under the heel, and with the brake arm held in what would be the closed position. Assemble the hardware and tighten. This endures that the shoe will hit the rim squarely and not tend to be driven under it or out toward the tire. Yoke length will also affect brake performance, but without knowing what you have now, I can't advise whether to lengthen or shorten it. As a general rule the yoke cable should come to the arms at about a right angle in the closed position, so it's tension pulls them inward, not upward, when the brake is applied. BTW- these brakes tend to be sensitive to friction in the pivots and can be hard to keep centered. Make sure to oil the pivots and return spring contacts with a decent oil, or light grease and wipe off the excess. That will guaranty predictable centering for a long time, otherwise you'll go nuts constantly adjusting one side's spring tension to re-center as one side or the other sticks. Last edited by FBinNY; 02-21-10 at 11:57 AM. Both. 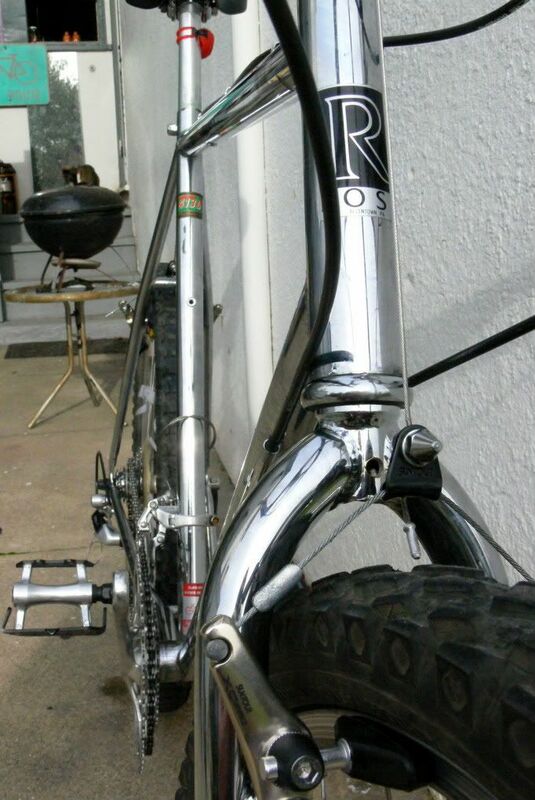 But mainly because I remember the Suntour brakes from that era and they were dreadful pads. Nice brakes, but dreadful pads. Also, I would lower the straddle cable yoke and shorten the straddle cable a bit. You will get more power but the brakes will feel a little bit more squishy.